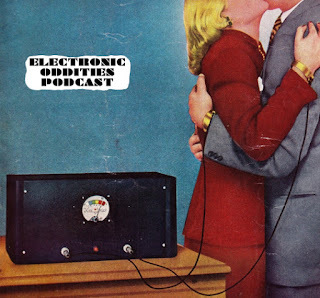 Its now just over a month since the first season of my ELECTRONIC ODDITIES PODCAST finished. You may or may not be overly familiar with the series and if you want or need a refresher you can find all thirteen shows in the series right HERE! The Electronic Oddities Podcast served a number of different functions for me. It was primarily a show I did to showcase new and differing kinds of electronic music. It served this purpose very well and encompassed a number of "old faves" of mine, and others, as well as music I and probably very few others had ever heard before. I wanted it to be a mix in every possible sense, of unknown and known, of music you might like and music I hoped you wouldn't. This later point gives away its educational purpose too. I was, in the thirteen shows, also trying to get some points across. In my head I hope that some listeners heard something they might not have liked before but now find that their horizons have shifted slightly. Certainly before this year I never would have included any noise music in such a show. And yet, in this series, noise tracks pop up here and there and show eleven is only use of noise. I approached the series seriously, trying to do a good job of it. Of course, you could point to lots of tracks and electronic music styles I probably missed out. But I was trying to do a good job. I'm not usually one for feedback. I'm not on Facebook spam posting my works looking for hundreds of "You are great" type comments in reply. I treasure privacy and, to some extent, anonymity. This sets up a conflict when I make something or want to publicize something because I have to do something that, in some respects, my better nature is rebelling against. I would really rather let things speak for themselves if I can. This is hard though today because most people take the packaging for the product and have the attention span of a gnat. On Bandcamp I can see in the stats how people have barely given a track 30 seconds of their time and decided its not for them. This is a pitifully small span of time in which to make your impression. In a similar way, I didn't really want to put track listings on my podcasts on Mixcloud where Electronic Oddities is based but a couple of people semi-complained that they wanted to know what the tracks were and so I deferred. That bothered me because if people think they know then they will base judgments on that. But I didn't want them to "know". I wanted them to experience. The latter, I think, is the much more valuable thing in the end. "Knowing" is a closed thing whereas "experiencing" implies opening yourself up. I noticed some interesting things about the podcast as I went through the thirteen weeks. Besides the surge of interest that came with the first show of a new thing, the most popular show has been the fifth one which was a modular synth special. This was probably the best advertised show, since there are numerous Facebook groups dedicated to modular synthesis in which to post the show's existence. So this perhaps explains this show's popularity. I was a little surprised, and a bit upset, that show nine, which was dedicated mostly to classic 80s dance music by people like Juan Atkins, Kevin Saunderson and Man Parrish, was the least popular. So-called "EDM" seems so all-consuming nowadays but without such artists, and the technology they harnessed to make it, there would be no EDM. This show was a history lesson and a reminder to remember where this music came from but it seems to have gone largely unheeded. My final show was music specially commissioned for the podcast and I'm glad that got a decent hearing. There are numerous talented people out there who make electronic music and its good, from time to time, to spread the word about some of them so we can share the encouragement of appreciation around. I was happy to put the time in to do my bit for that. Overall, pretty much every podcast of the thirteen made a mark in the Mixcloud charts. A number hit top ten in their genres. Some made top five. All this tells me I was doing something that at least a few people might want to listen to. There were a number of thankful comments left too which were, of course, unrequested but welcome nevertheless. The problem comes when I ask myself what to do now. I have a fixation about not repeating myself so instinctively I fight against the notion of "Electronic Oddities Season 2". I could probably do that and hopefully maintain the standard I reached in season 1 but I would be asking myself why I was doing it the whole time. So the best scenario would be if I could carry on doing a similar thing but not the same thing. My aims in my next season of podcasts would be to continue playing an almost random mixture of electronic music, new and old, that might strike the prospective listener as interesting and engaging. I want to provide a podcast that people want to listen to and come to trust as worth listening to. I don't know if I did that first time round because there are some questions you shouldn't ask in case you don't like the answer. But I know a few people who said they looked forward to it. So maybe I did. I would probably want to broaden the scope of the show slightly so I have creative freedom to have themed shows or one-off specials. So I'm thinking something like "The Doktor Existenz Radio Show" at the moment. But it will still be everything Electronic Oddities is. And hopefully a bit more. Such a show will, of course, stand and fall by the music played and by word of mouth. I set myself fairly low targets in terms of listenership. For reference, my least listened to show in season one of Electronic Oddities was over the threshold I set for it being worthwhile. Whilst I might argue I'm doing this for myself, and that's true to some extent, in the end you don't publish podcasts unless there are listeners. I wasn't sure when I initially set out, earlier in the summer, that I would even finish series one. But now here I am musing on series 2. And I have some ideas for this. There are songs I want to play, themes I want to explore and new music I want to find. I just want to make a varied and interesting electronic music product for people who can appreciate the same thing. Hopefully, some of you reading this will join me for the ride for 13 weeks from September 2nd. Well, we sold 2 albums off the back of one of these shows, so thanks very much for that. You could always do an occasional 'Electronic Oddities' - you're not contractually obliged to do a full series of anything. Blogger won't let me post from my google profile hence anonymous. Thanks again for playing Tingle In The Netherlands. Looking forward to hearing what you come up with next. HT.